Girl Rising has partnered with the International Rescue Committee, Citi, HP and Amplifier to create a film and campaign around the story of one courageous young woman named Nasro. Brave Girl Rising, to be released this March on International Women’s Day, is written by the poet laureate Warsan Shire and narrated by actress Tessa Thompson (Selma, Creed, and the upcoming Men in Black International). In our previous blog posts, we talked about the refugee crisis and introduced you to Warsan Shire and Girl Rising. Today’s blog takes us to Dadaab, as Martha Adams, who directed the film with Richard E. Robbins, discusses her first trip there. As a Somali refugee, Warsan Shire had her own very personal reasons to choose Dadaab Refugee Camp as the location of our film, but when I arrived I knew this was where Girl Rising belonged. It was surely one of the toughest places in the world to be a girl. Dadaab, for girls, is not safe. Forced marriage is not unusual for girls as young as 13, food is scarce, water access is unreliable, and life expectancy for women, according to staff inside the Labor and Delivery ward of the hospital, is only 52 years old. Making a film here would be one of the hardest challenges we’ve faced. We flew in to Dadaab on a United Nations charter airplane and landed on a runway just 60 miles from the Somali border; the only bit of paved road for miles. An hour later, we found ourselves in a tiny office on the UN Compound listening to a chilling security briefing that outlined all the different ways we were in serious danger, from attacks and abductions to IEDs (improvised explosive devices blasts) that were so commonplace our bathrooms were retrofitted with tank armor. This was an unsettling welcome. Then came the time to meet the International Rescue Committee team tasked with hosting our visit. Whenever possible the IRC looks to the local population for expertise and in Dadaab they work with an interesting mix of Kenyans and people of Somali descent. Ibrahim, Terrie, Rafael, Jackie and Bishon made up the heroic group that ran IRC’s life-skills programs for women and girls. Without them, I do not like to think about what life would be like for the girls and women in Dadaab. The truth is, where some might see only ruin, the IRC sees opportunity. This intrepid organization runs the only hospital for the 130,000 living in the section of the camp we were visiting, and they’ve implemented ambitious programs geared to all aspects of life for Somali women and girls. What they provide for girls and women here is monumental. The boys and men can walk alone, and play sports in the open patches of desert, they have bars to watch football matches, they have freedom. The women and girls are far more limited. So, the IRC built Women’s Centers; safe places for them to be. The IRC has filled this vacuum with forward-thinking resources and programs. For instance, many of the girls we met spoke with confidence against female genital mutilation (FGM). Rates of FGM among Somali women are among the highest worldwide, but thanks to the efforts of groups like the IRC, the incidence is dropping dramatically. Within these charming safe spaces, the IRC runs programs where they talk about women’s health, give women and girls an opportunity to speak up if they’ve been assaulted or raped, and foster mentors among the girls. Over and over, when sitting down to meet with the girls, they spoke up about what they need: textbooks, lights, and sanitary napkins. We also heard pleas for school uniforms and a field to play sports. Water is scarce at the camp. The taps are only turned on at 7am and 1pm, and women and children are usually the ones tasked with the chore of gathering the water and bringing it home. This can be a dangerous journey, especially for girls, as they can encounter sexual harassment and dangerous wildlife, especially in the early hours of the morning. It’s among these amazing girls where we started looking for who would be at the center of our film. As we’ve done in our previous countries, the big job on our first trip is getting to know what life is truly like for girls. We try to meet with at least 100 girls in group settings, and then conduct one-on-one interviews with about 30 girls before passing along five final candidates to the writer. The interview process is always complicated, with language and cultural barriers beyond measure, but I’ve never experienced the chasm of culture that I felt in Dadaab. So many of these girls were born in this barren refugee camp and have never left it, even to walk to the next refugee camp down the road. Their lives are so constrained that for many, their dreams have been bound and stunted. Most of the girls had a hard time answering the question of what they wished for, because they had no context. Few had seen anything beyond the twig fencing and dusty roads of their camp. They had no memories, no pictures of home, no history. Then, miraculously, almost mysteriously, a girl would sit down to be interviewed and she would surprise us, fill us with hope and wonder. One of the most charismatic girls we met there was Asmo, a beautiful 19-year-old, adorned with intricate henna designs. For Asmo and her mother, school was a vital path out of poverty. Her father, however, feared contact with boys and forbid her from attending school. Despite his disapproval, her mom helped Asmo get to school, providing excuses for why she was not at home and hiding the fact from her husband. When he would discover this, he’d beat her mother. At school one day, Asmo shared this story with representatives of the IRC. They then met with her father to discuss how important school is. He listened closely and eventually relented. When asked how she would title her autobiography, she said “Girl Shine” which is also the title of IRC’s life skills program for girls in the camp. Here Asmo sings her favorite song which is about the importance of education. “If you don't have knowledge, there is no light in your life. Without education, it’s like living in darkness. We, as brothers and sisters, must go to school to get an education." Asmo lived close to one of the IRC women’s center and always loved stopping in to interact with the girls there. Later, when her parents told her she had to drop out of school to take care of her younger siblings, she turned to IRC for help and managed to remain in the classroom. Today she is a mentor and role model to younger girls, especially those who must advocate for their right to go to school. Her dream is to work in women’s empowerment, against FGM, early marriage and gender-based violence. And best of all, when asked about her relationship with her father, beaming ear-to-ear, she responded: “It’s perfection. He now supports my education." Nasro is supported by the International Rescue Committee’s Women’s Protection and Empowerment program in Dadaab. She was one of many remarkable young women in Dadaab, but very quickly I saw how she was the ideal candidate for the film. So much of her personal story was reflective of the lives of girls here but also inspiring. When she and a friend were attacked on their way to school, Nasro fought back. This is unusual for her culture, and Nasro herself isn’t quite sure what compelled her to act. For many girls around the world, the walk to school is so dangerous that parents are forced to choose safety over their daughter's education. Nasro, in her determination to be at the top of the class, arrives early and braves the walk in the dark. Nasro’s memory was also intact. 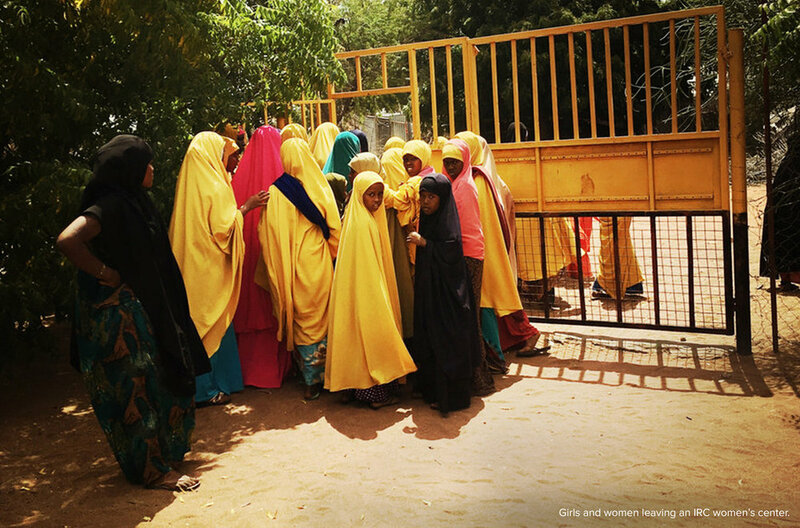 Half of the the girls I met were born in Dadaab— it’s all they’ve ever known. Even teenage girls who’d arrived at the camp four years ago, at an age when they could remember the experience, had no recollection. PTSD had blacked it out, IRC leaders explained. Nasro, however, remembers the trip. She came to Dadaab with her grandparents, who are now dead, when she was 7-years-old and already an orphan. She shared how on their journey a bus was attacked and a man who might’ve been a doctor ran to help the injured. Today, she dreams of being a doctor. Wherever we go, when we interview girls, we always ask what they want to be when they grow up. I usually hear answers like teacher, nurse, NGO worker. When I asked it here in Dadaab, nearly a quarter of the girls, said “a pilot.” I’d never heard this before. Then I looked up. The only thing they see leaving here are planes. They want to get out. One girl said she’d fill the plane with her friends and all the women she knew and fly away. from Girl Rising and from the IRC.